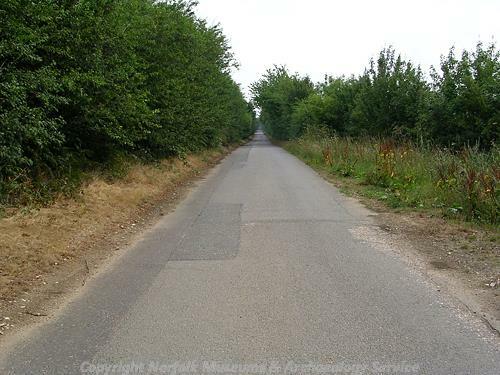 The Fen Causeway is the name given to the Roman road which runs from a junction with Ermine Street and King Street near Peterborough across the Cambridgeshire and Norfolk fens. It was first recorded by Dugdale in 1772. In places the road is known to run along the crest of a roddon of a natural watercourse and is therefore quite sinuous, while straighter alignments may follow an artificial canal. 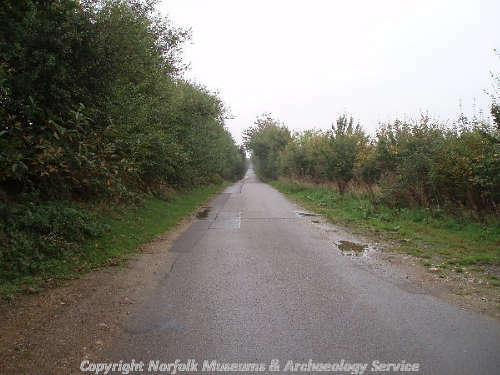 In Norfolk, the Fen Causeway runs between Upwell and Denver, but in places there is more than one possible route. East of Denver, the road then probably divides into two, with one route heading due east to the Roman town of Venta Icenorum at Caistor St Edmund (NHER 9786) and the other heading northeast towards the Roman town at Brampton (NHER 1006 and 1124). The upland continuation of the Fen Causeway between Denver and Brampton is included under NHER 2796. In a number of places the road is visible as a cropmark on aerial photographs, whilst in several places it survives as a landscape feature. Sections of the road have been excavated on a number of occasions, revealing a cambered metalled surface and side ditches. At Denver, it is dated to the 1st century AD, and there is evidence of extensive settlement and salt production beside it (NHER 4240). Excavations at Downham West in 1993 examined a complex sequence of deposits, including the roddon of a natural watercourse into which a canal had been dug, probably in the early 2nd century AD. The first road surface was found to predate the canal, while a second road surface probably ran beside the canal. Fen Causeway/east to west Roman road. See detailed description in file of course, excavations, etc. Roman bridge on line in Downham Market. Medieval pottery and ironwork from section at Marsham. Possibly pre Roman track in part. See overlays: 6 inch - TF 50 SE, TF 70 NW; 1:2500 for section 5410 9965 to 5380 9963, and 5501 0014 to 5767 0033. List of aerial photographs in file. Roman road with contemporary deep, wide ditches. Roman briquetage. It was reported that a cut had been made through the Roman Road near Salter's Lode. It was described as very hard set gravel, three feet thick by 60 feet wide, and much barrelled. However, this has since been interpreted by R. R. Clarke as a roddon. Norfolk Archaeology v. 3, 425; CASC I Report of 6 III 1854 and IV, 205; Babington, Ancient Cambridgeshire, 1883, 70-71. H. Hamilton (NLA), 13 December 2007. The line of the road in Denver parish was revealed at 5804 0034, where it was cut in field 436 on Lake Farm. The surface of the road was seen in section at 2.79 feet above OD. A Roman pile bridge constructed across a roddon was excavated by E. J. A. Kenny. The bridge was located 400 yards south of Middle Yard Cottages (5734 0038) in Downham West parish. Postholes were recorded and a Castor ware beaker was found in the silt bed of the roddon. A section of the Road was observed at TL 534 995, Neatmoor Farm, field no 1260. The section was flooded and re-metalled (two layers of gravel were seen). The route of the road diverges from that depicted on the Ordnance Survey map (1958 6 inch?) at this point. R. R. Clarke, PSAS XLIII 1950, 10. 1989-1992. Fenland Evaluation Project Investigations. Cleaning of dyke-side at London Lode Farm (TL 5238 9912), Nordelph. The later of the two Roman roads was clearly visible, its deposits sealed beneath post-Roman silts and constructed on a (?In situ) briquetage-rich organic deposit. 1992. Fenland Management Project Excavation. Further investigation of the Roman road at London Lode Farm, Nordelph. Excavation of trench in paddock immediately adjacent to the previously cleaned dyke-side. See summary report (S26) for further details. P. Watkins (HES), 10 February 2014. An excavation was conducted on the line of the road, imediately west of the Launditch (NHER 7235). Ditches of the road were recorded as well as a pit containing Iron Age or Romano-British pottery sherds and stakeholes. Slag was also recoverd. A third trench was placed at the location where the road is presumed to curve southwards, but no traces of the road were found. Additional details in secondary file for NHER 7235. H. Hamilton (NLA), 11 February 2008. 13 July 1993. NLA air photography. A short stretch of the Fen Causeway can faintly be seen in photographs of the enclosure (NHER 7481) south of Martinole Farm (TG 149 229). The enclosure abuts against the road. S. Massey (NLA), 8 February 2001. 26 June 1996. NLA air photography. A section of the road is visible as multiple parallel ditched linear cropmarks, running from TG 22752450 to TG 23132450. S. Massey (NLA), 24 September 2001. Cropmarks of fen causeway are visible to the west of the railway line (NHER 13587). Visible as linear cropmarks to either side of a field boundary, from TG 2505 2366 to TG 2470 2359. The line of Fen Causeway is represented by the edge of Litcham Common. At TF888170 there is a stretch of double linear cropmarks which may indicate its course, and a cropmark of a double linear feature along the course of the Fen Causeway is located at TF879167. The course of Fen Causeway is also visible on aerial photographs at the point of cutting across Launditch (NHER7235). Sections of Fen Causeway and bank are visible as cropmarks in the Downham West area (c3) (c4). Linear cropmarks are visible at TF 8716. D. Gurney (NLA), 16 September 2003. (S1) on CD on digital storage shelf and R:Associated Files. 2003. Excavations by NAHRG northeast of Coltishall Airfield. Three trenches were excavated in order to locate cropmarks of the Roman road and a series of linear ditches. Sections of the Roman road were excavated in Trenches 1 and 3. The only archaeological feature encountered in Trench 2, intended to locate one of the linear features, was the edge of the northern ditch of the Roman road. See NHER 36729 for details. Information from (S21) and (S22) in file. 2003-2005 (at some time). Geophysical Survey northeast of Coltishall Airfield. A resistivity survey was carried out in Area A (see S22) in order to locate the set of five linear ditches and the Roman road previously identified as cropmarks in aerial photos. Information from (S21) and (S22). H. Hamilton (NLA), 13 March 2008. 2005. Excavations by NAHRG northeast of Coltishall Airfield. Further work was undertaken in Area A. Trench 4 located one of the linear features. Three sections of the features were excavated, and the intersection of the Roman road was located in the south of the trench. This work confirmed that the linear feature pre-dates the road, although no dating evidence was collected from any of the sections excavated along the ditch. A substantial bank aligned approximately east–west and measuring about 15m wide and up to 1.2m tall was identified at Burnt Plantation, Marsham (formerly Marsham Heath). The orientation of the bank suggested that it should continue into arable land to the east, but it ended abruptly on the edge of Burnt Plantation. This sudden end and the fact it had an almost vertical face suggested the bank had been levelled in the arable land. Using a hand-held GPS unit it was possible to accurately record the location of the bank, to determine that it lay on the line of the Roman road and to establish it is was probably the agger mentioned in (S23). See (S24) for more information. D. Robertson (HES), 15 August 2011. The earthwork noted at TG 0070 2005 (see file), adjacent to and immediately west of the Billingford Roman site (NHER 7206), has been destroyed by the levelling and construction of a track. D. Gurney (HES), 26 January 2011. A section of this Roman road visible on aerial photographs (S25) from TG 2804 2383 to TG 2744 2381 at Scottow was mapped in advance of archaeological fieldwork at the site in 2005 (see NHER 36729 for details) and was included within an area of mapping undertaken in advance of Norfolk County Council acquiring the RAF Coltishall site in 2010. S. Horlock (HES), 30 August 2012. --- Photograph: JQ 32, 26. --- Article in Serial: Gurney, D. (ed.). 1993. Excavations and Surveys in Norfolk 1992. Norfolk Archaeology. Vol XLI Pt IV pp 522-532. pp 527-528. --- Archive: Ordnance Survey Staff. 1933-1979?. Ordnance Survey Record Cards. TF 50 SE 2 , TG 02 SW 6 . --- Article in Serial: Gurney, D (ed.). 1990. Excavations and Surveys in Norfolk 1989. Norfolk Archaeology. Vol XLI Pt I pp 107-112. p 109. --- Archive: Clarke, R. R. and NCM Staff. 1933-1973. Norwich Castle Museum Record Card - Roman. Hoe. --- Archive: Clarke, R. R. and NCM Staff. 1933-1973. Norwich Castle Museum Record Card - Medieval. Marsham. --- Article in Serial: Clarke, R. R. 1955. Norfolk Research Committee Excavations, 1954. Norfolk Research Committee Bulletin. Series 1 No 7 (for 1954) p 1. <S1> Article in Serial: Kenny. 1933. A Roman Bridge in The Fens.. Geological Magazine. Vol 82, pp 434-441. Pp. 434-441. <S4> Monograph: Silvester, R.. 1991. The Fen Causeway and Wissey Embayment.. East Anglian Archaeology. Vol 52. Pp. 95-140. <S5> Unpublished Document: Penn, K.. 1992. NAU Report No. 1. Excavations on the Launditch (Site 7235) and Roman Road (Site 2796), Norfolk..
<S6> Aerial Photograph: Edwards, D.A. (NLA). 1993. TG 1422E - H.
<S7> Aerial Photograph: Edwards, D.A. (NLA). 1996. TG 2423AC - AD. <S8> Aerial Photograph: Edwards, D.A.. 1996. TF8117/S - T.
<S9> Aerial Photograph: Edwards, D.A. (NLA). 1996. TF8716/AP - AS; TF8816/AB, AC. <S10> Aerial Photograph: Edwards, D.A. (NLA). 1996. TF9216/H - J. <S11> Aerial Photograph: Edwards, D.A. (NLA). 1996. TG 2223AGY - AGZ. <S12> Aerial Photograph: Edwards, D.A. (NLA). 1996. TG 2223AHA - AHD; TG 2323E. <S13> Aerial Photograph: Edwards, D.A. (NLA). 1996. TG 2423AM - AP. <S14> Aerial Photograph: Edwards, D.A. (NLA). 1996. TL 5299AP - AV, AX - AY; TL 5298G; TL 5198G - K.
<S15> Aerial Photograph: Edwards, D.A. (NLA). 1996. TF 5700ACM - ACN, ACS - ADB, ADE - ADF; TF 5800W - Y; TF 5600M - Q. <S16> Aerial Photograph: Edwards, D.A. (NLA). 1996. TF 5600S - U; TF 5700ADG - ADH; TF 5800Z. <S17> Aerial Photograph: Edwards, D.A. (NLA). 1996. TF8716/AH - AJ; TF8816/Z - AA. <S18> Article in Serial: Ashwin, T. 1999. The Launditch and its Setting: Excavations at the Launditch, Beeston with Bittering, and Iron Age features and finds from it vicinity. Norfolk Archaeology. Vol XLIII Pt II pp 217-256. <S19> Monograph: Crowson, A., Lane, T. and Reeve, J. (eds). 2000. Fenland Management Project Excavations 1991-1995. Lincolnshire Archaeology and Heritage Reports Series. No 3. pp 167, 192-197. <S20> Oblique Aerial Photograph: Page, M.. 2003. NHER TF8716 AW-AX. <S21> Unpublished Document: Sims, J.. 2005. Excavations at Scottow 2003 and 2005. Interim report..
<S22> Unpublished Document: Sims, J.. 2006. Excavation at Scottow 2003 & 2005. <S23> Monograph: Margary, I.. 1973. Roman Roads in Britain.. Vol I, p 239. <S24> Article in Serial: Robertson, D. & Paterson, H.. 2010. The Norfolk Monuments Management Project 1990-2010. Twenty Years Conserving the County's Rural Historic Environment.. Norfolk Archaeology. XLVI, pp 15-28. <S25> Oblique Aerial Photograph: Edwards, D.A. (NLA). 1996. NHER TG 2723A-R (NLA 371/HSH9-15, HSJ1-3) 18-JUL-1996. <S26> Unpublished Contractor Report: [unknown]. Fenland Management Project, Norfolk. A Section Across the Fen Causeway at London Lode Farm, Nordelph. Archive Summary Report. Norfolk Archaeological Unit.